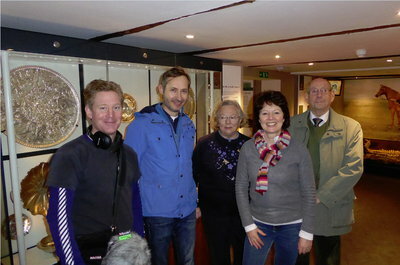 On Tuesday January 10th 2017 Mildenhall Museum welcomed Radio 4’s ‘Open Country’ [click here for link] presenter Helen Mark and producer Toby Field. They were in the area to record a new edition of the popular programme and had arranged to make a segment of it in the museum. Accompanying Helen and Toby were Richard Hobbs, Weston Curator of Roman Britain at the British Museum, and Mr & Mrs Sydney Holder. Also interviewed was Museum Chairman, Stephanie Palmer, who talked about the Treasure’s significance to Mildenhall Museum and the local community. The Museum’s volunteers were very much taken with Helen’s friendliness and impressed by the BBC’s relaxed professionalism. If they can find something else in the collections as the basis for a programme, we would willingly have them back! The programme was broadcast on Thursday February 2nd 2017 at 15.02 on Radio 4 with a repeat on the following Saturday at 6.02 am. If you missed it, you can catch up on BBC i-player [click here for link]. By coincidence, at lunchtime the same day about 300 people attended a lecture at the British Museum’s BP Lecture Theatre, given by Richard Hobbs. Entitled ‘The Mildenhall: fine dining in Roman Britain’, the lecture followed the recent publication of Richard’s important new book “The Mildenhall Treasure: Late Roman Silver Plate from East Anglia”, in which he presents his latest research into the Mildenhall Treasure and its place in the wider late-Roman world.